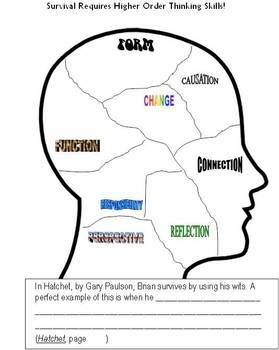 We read Hatchet by Gary Paulsen as part of our CCSS Unit. I had my students will find examples of higher order thinking skills Brian used to survive. We categorized them under the eight Key Concepts. Worksheet can be easily modified to work with any novel - just change the titles. I've included some samples and some answers that my 6th Graders found. 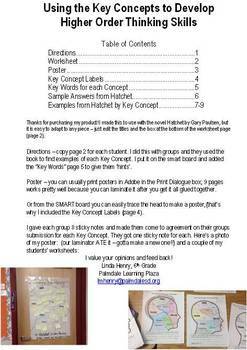 I made a poster size version and laminated and had students write examples on sticky notes.